It’s time to get up close and personal at Alligator Adventure! 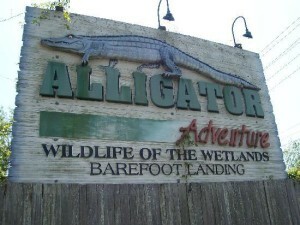 You can find Alligator Adventure located in front of Barefoot Landing in North Myrtle Beach. While alligators are the main attractions, you will also see birds, cats, exotic animals and lower primates. There are more than one hundred alligators on-site of all shapes and sizes. While walking through the adventure visitors can enjoy a feeding show, which is a real treat. Watch as the trainer charms the beast out of the water and onto dry land for a delicious chicken dinner. There are many other live shows that visitors can see while walking around, but this is one that you don’t want to miss. The collection of gators ranges from ten-footers, 15-footers and even a 20-foot croc named Utan. On an average day, you will see the majority of Gators sunbathing and walking around the lakes of the park. Keep in mind that trainers supervise the alligators, and Alligator Adventure is safe to your and your family. Once you’ve finished checking out the alligators, it’s time for the snake house. Take a look around at the rare collection of snakes including displays of deadly venomous creatures from around the world. Before you leave the adventure be sure to check out the Siamese tiger siblings. It’s a very popular exhibit to visitors and locals alike. Ticket prices range from $14.99 for kids to $19.99 for adults. The park is open seven days a week from 9 a.m. to 7 p.m.